Melaleuca pentagona is a medium shrub that has reached a height of three metres in our cold climate garden. Leaves may be rounded to oblong and a few centimetres long. 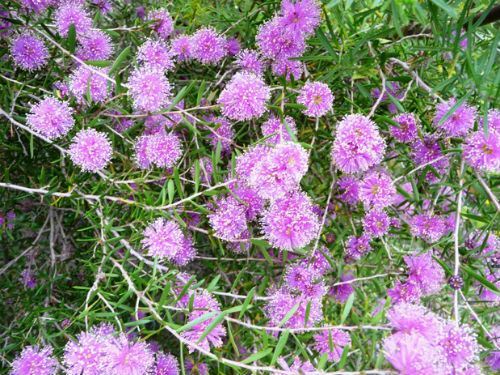 Pink to purplish, rounded flower clusters appear in spring and are about two centimetres across. They are carried on the ends of branches and in leaf bases. Blooms are both conspicuous and profuse. Prune lightly after flowering. 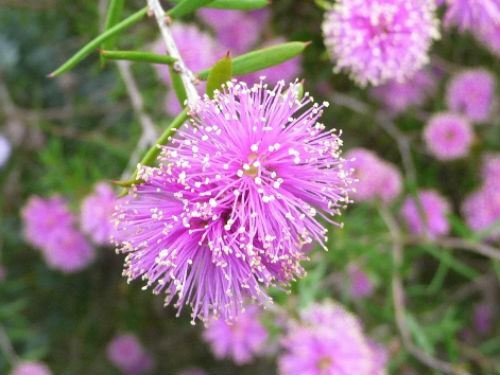 Melaleuca pentagona is one of a large number of species that occur in the south-west corner of Western Australia. Many of these melaleucas, including M. pentagona, are virtually unknown in cultivation but have great horticultural potential. The species name refers to the 5-sided woody fruits. Propagate from seed or cuttings that produce roots rapidly and readily.